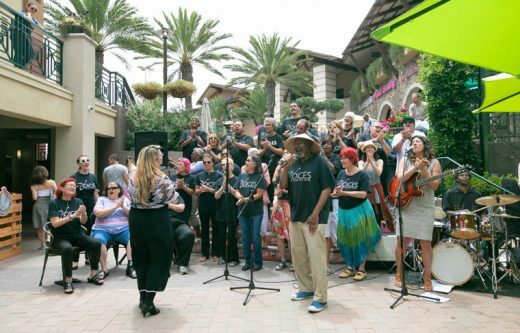 In two short years, San Diego’s Voices of Our City Choir has vastly transformed the perception of homelessness by connecting diverse communities in positive ways through musical performance, advocacy and education. With the fraying of community bonds and the gaping holes in the U.S. safety net leaving millions of Americans only a health crisis or a job loss away from becoming homeless, the crisis of homelessness touches more of us than we’d like to admit. On Feb. 1, Idyllwild Arts Academy’s annual Art in Society Symposium will present “Uneasy Street – Untold Stories of the Homeless.” The annual series focuses on misunderstood groups and endeavors to connect with those groups through communal art projects and stimulating dialogue. The Art in Society program is coordinated by Eduardo Santiago. The Art in Society program gives the academy’s high school artists opportunities to link the development of their craft to efforts to solve social problems — a task for which the arts, with their persuasive powers, are well suited. Because the creative population of Idyllwild Arts is best reached through the arts, the 2019 symposium will feature San Diego’s renowned homeless choir, Voices of Our City. They will appear along with the Los Angeles Poverty Department (LAPD), a performance group closely tied to Los Angeles’ Skid Row neighborhood. At least for one day, Feb. 1, the small but active community of Idyllwild will have a chance to hear the truth about homelessness. The event is from 9 a.m. to 4 p.m. Friday, Feb. 1, in the William M. Lowman Concert Hall and the Idyllwild Arts Foundation Theatre on campus.